Going Mobile? Well you will find setting up communication in your vehicle a bit easier than portable communications . Both means of communications are easier but the mobile tends to be a little easier to handle than setting up portable antenna systems. Going mobile is definitely easier than setting up a fixed base antenna. So why go mobile ? Well only you can answer that but there are times when a survivalist would be going from point A to point B. 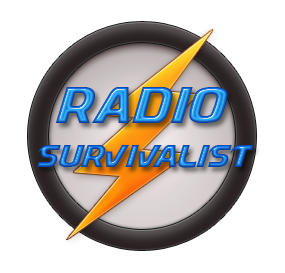 Having reliable communications while traveling is a must whether you are a survivalist or not. What’s it take to go mobile? That’s easy enough, just need a radio capable of running on 12 volts and an antenna that will tune to the frequency (or frequencies) that your mobile radio requires. You can run anything from high frequency up to and including ultra high frequency. When Is A Mobile Not A Mobile? 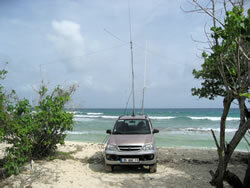 Mobiles are used a great deal by amateur radio operators and many times they attached a larger antenna to their vehicle while running portable operations such as viewed below. 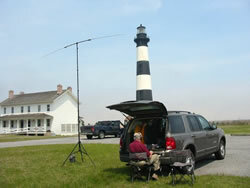 In these instances the radio operator has moved their vehicle to a remote location and attached a larger antenna and are running as portable operators. These applications of mobile antennas are ideal for a survivalist out in the remote ares they tend to operate out of. There are quite a few but one of the most popular mobile antenna is likely to be the “screwdriver” antenna. 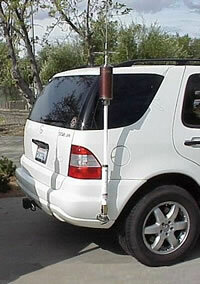 This antenna is called this because of the way it can be tuned from inside your vehicle. You can be zipping down the road at 70+ mph and switching bands on your radio and tuning your antenna for maximum performance. Of course there is the ever present (but limited) mobile whip. Another antenna that you will see on mobile communications with one mast and 2 or more resonators on top of them. While this may not appear effect to the untrained eye it actually works quite well.